Hostel 19 Langkawi i Langkawi, Malaysia: Reservér nu! Hostel 19 Langkawi is simply the premier backpacker hostel on Langkawi. 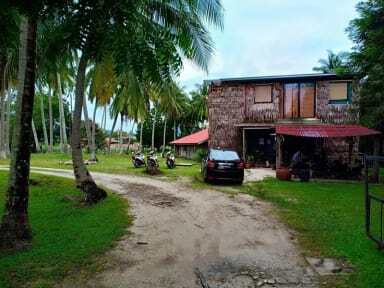 With a awesome location, 7 min walk away from the main beach of Cenang yet nestled away between a bird sanctuary and a river the 2 acre property is one of the last filled with coconut trees and the true island atmosphere. All our beds have chiropractic mattresses while our dorm beds also have curtains, a reading light a electric outlet all in a comfortable air conditioned space. Free wifi, towels for rent and water available at the reception. With a stunning view of the setting sun to the west at night and the proximity of Cenang Supermarket , food court and other restaurants makes the location unbeatable. The hostel was built out of up-cycled material to blend in with nature and be true to the space we have. Feel free to stop on by and have a look for yourself. 2. Check in from 14:00- 23:00.